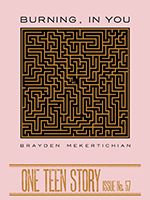 ONE TEEN STORY is an award-winning quarterly literary magazine that features the work of today’s best teen writers (ages 13-19). 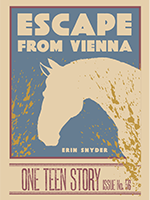 One Teen Story subscribers receive one great short story at a time in print or on their digital devices. To increase the visibility of these up-and-coming writers, One Teen Story will also be sent to all One Story print subscribers starting in 2017. Get it for yourself or give it as a gift. 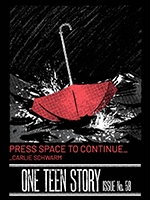 In Teen Writing Contest winner Carlie Schwarm’s “Press Space to Continue,” a teen gamer has to decide if his new friend is real or is part of the game.